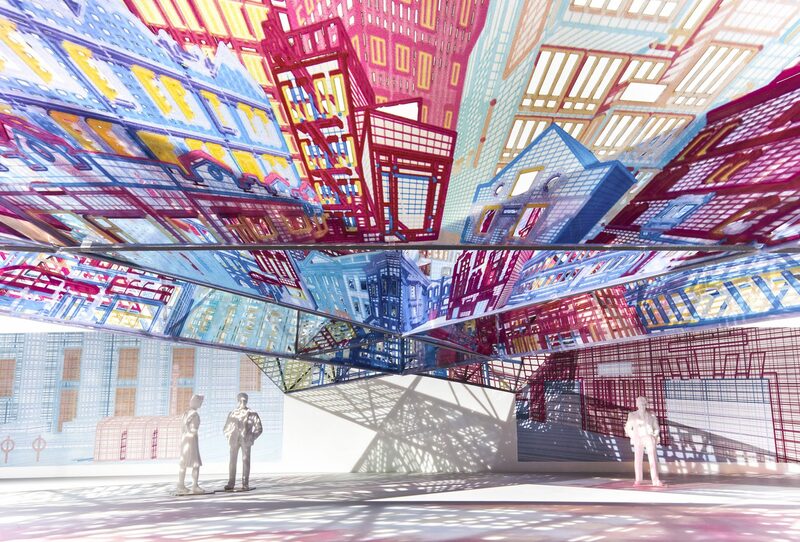 Our finalist proposal for the 2018 MOMA PS1 Young Architects Program, Out of the Picture, emerges from images. 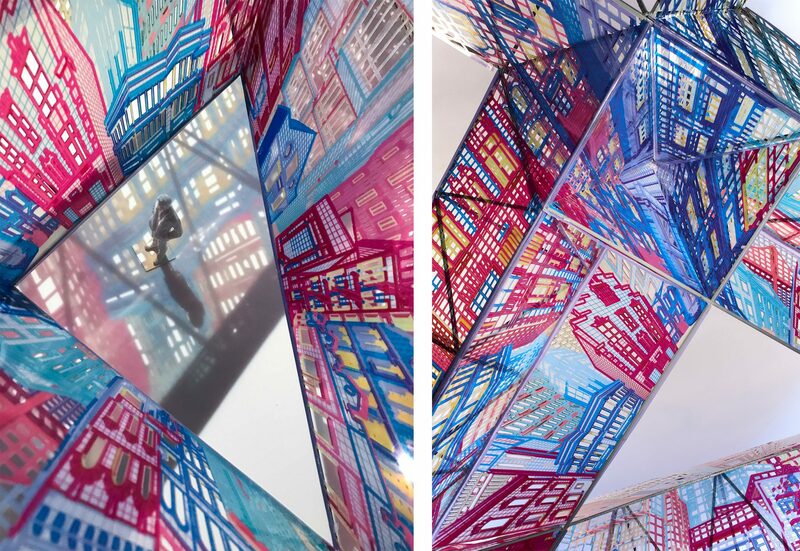 It’s a physical space for being together, but it is made to be translated into other, virtual formats. It borrows the language of images (graphic density, saturation, illusion, legibility) and translates it back into something physical. Visitors enter a world of imagery, where everything is somehow recognizable but a bit out of focus and low resolution. 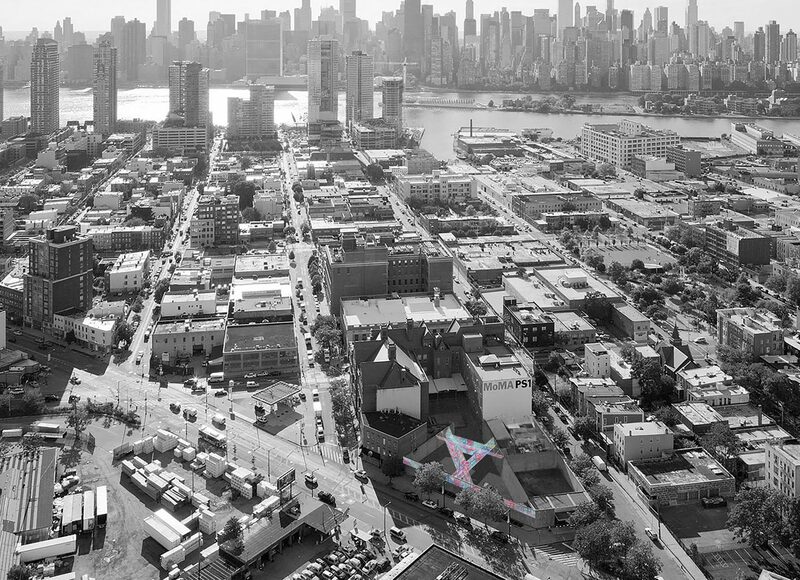 Our proposal brings the streetscapes of Long Island City into the PS1 courtyard, both literally and scenographically. Objects from the street (stoops, benches, mailboxes, fire hydrants) invade the courtyard while it’s bounding walls host views outward, onto the city. 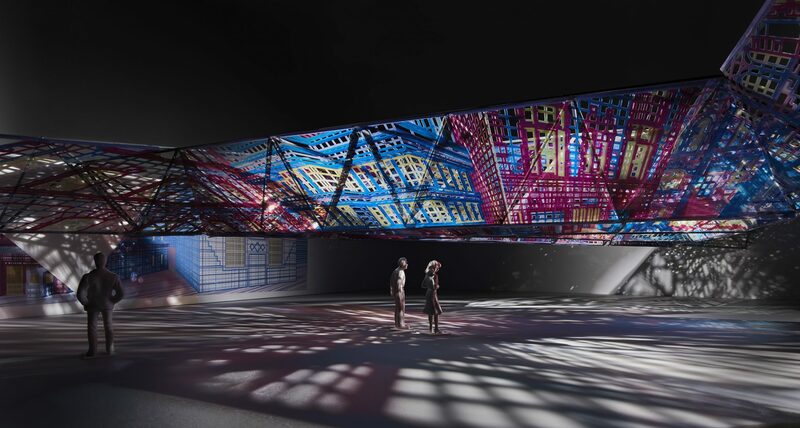 A canopy, woven from the same scenes, extends overhead, casting recognizable shadows. Out of the Picture isn’t all surfaces and flatness – it’s also about space. Appearances shift as you move; the courtyard fills with meaningful points of view where illusionary spaces emerge, layers align, objects and building come into view or disperse into pattern and color. 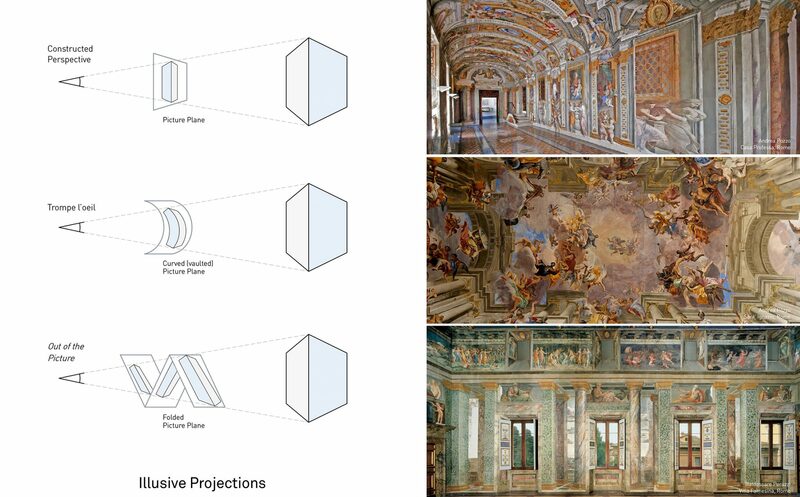 The project developed from our interest in the history of Trompe l’oeil, drawings that project out, through the picture plane, into the real world. Trompe l’oeil relies on a particular point of view, a place to stand where the illusion works best. 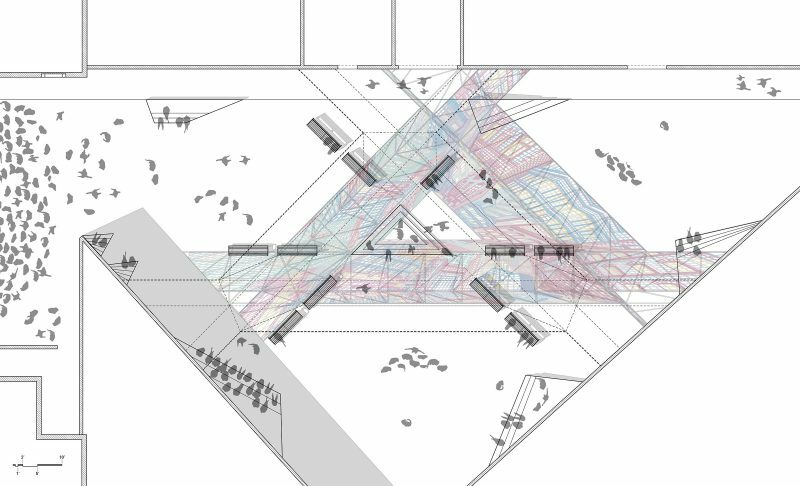 The proposed canopy acts as an intricately folded picture plane, creating multiple, simultaneous views of what’s being drawn. 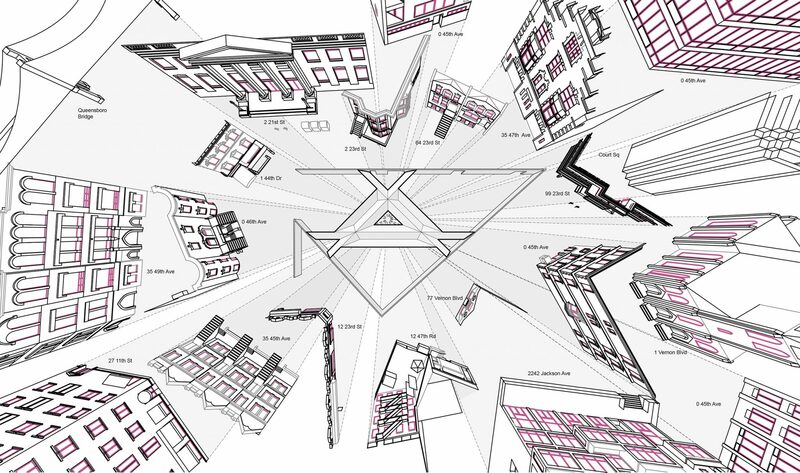 This multiplies the implied station points, dispersing them throughout the courtyard rather than consolidating them at a single center. 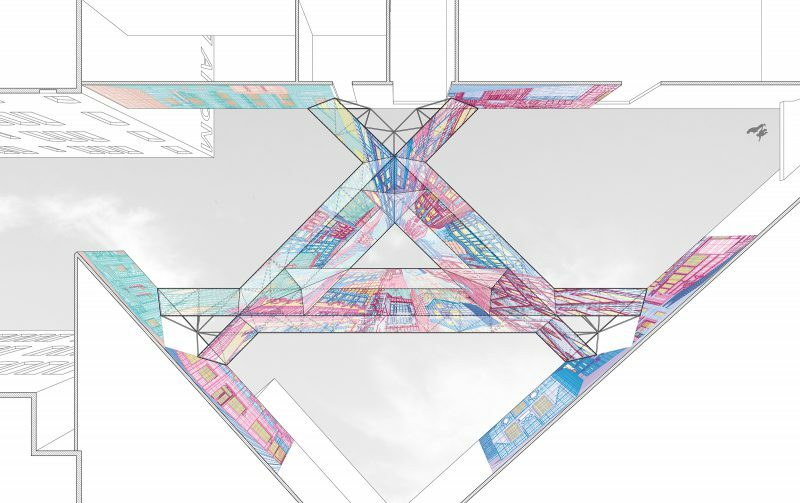 The canopy is made from three interlocking seven-foot-deep triangular trusses that span up to 90 feet between the walls of the PS1 courtyard. Fabricated by Fabric Images, Inc., Non-woven fabric would be printed, CNC-cut, and held taught by zippered connections, wrapping the truss. 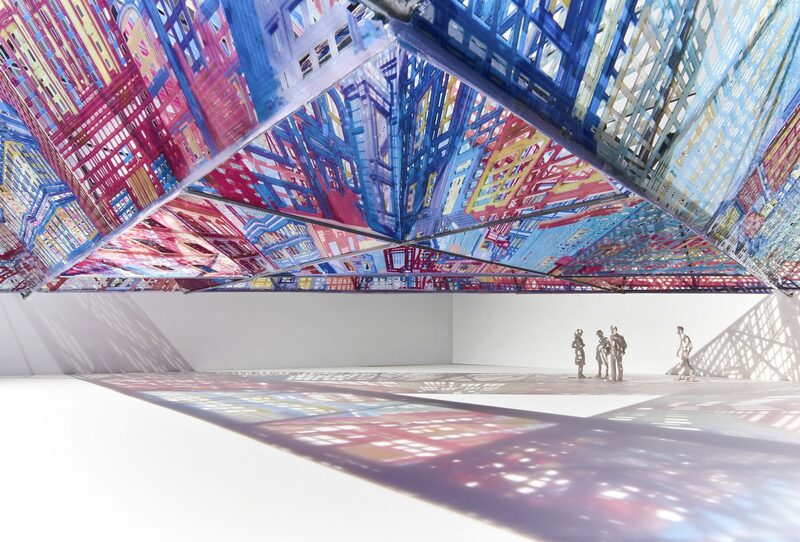 The result is a three-dimensional drawing at building scale that asks to be puzzled over and made sense of – both as a massive floating object and a continually surprising landscape of illusion.